Friends are the family you choose, and when you put eight comical friends on one stage, you get a guaranteed night of laughs and entertainment. 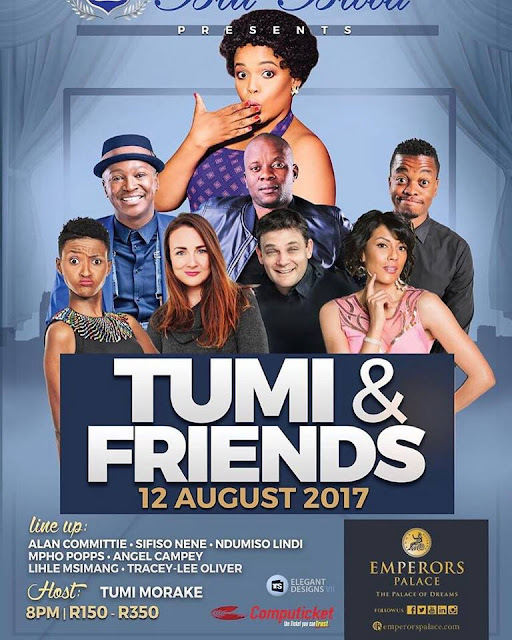 Tumi and Friends will have audiences in stiches at Emperors Palace, Johannesburg on the 12th August, 2017. With a pool of incredibly talented local comedians, Tumi Morake has rounded up some of her friends in the industry – pure comic forces to be reckoned with - and the stellar line-up includes Alan Committie, Angel Campey, Lihle Msimang, Mpho Popps, Ndumiso Lindi, Sifiso Nene and Tracey-Lee Oliver. Not stopping for a second, Tumi Morake’s impressive resume includes radio host, presenter, TV show host, brand ambassador, actress and Queen of Comedy – her unique ability to deliver all the laughs and right punches has become synonymous with what fans have come to expect from this clever, witty and hilarious comedian. No end to his talents, Alan Committie is one of South Africa’s leading stand-up comics. He has travelled all over the globe sharing his hilarious brand of madness. With only a few years in the funny business, Angel Campey has already featured on several major festival and arena comedy line-ups. Her brand of observational humour has been dubbed ‘comedy for the discerning young South African’. Lihle “Lindzy” Msimang is a bag of laughs. Vibrant and energetic, Lihle’s ‘clean’ comedy adds a well-needed feature to the face of comedy and appeals to a wide audience. With a unique style all of his own, Mpho Popps’ tempting stage personality, hilarious social commentary and high-energy impersonations has entertained South Africans around the country. From the first time you see Ndumiso Lindi, you can’t help but feel good. His novel blend of nu-school style and solid tradition makes for a brilliant and outstanding South African comedy act. His deep voice, soul-warming smile, booming laughter, original content and seamless delivery leaves you proud to be African and laughing from the belly. On stage telling jokes is where Sifiso Nene is most comfortable. He is known for putting a humorous twist to his day-to-day experiences. Tracey-Lee Oliver is a powerhouse singer, comedian and actress. While she is no stranger to the stage, her move to musical comedy has taken her to another level. You will be in very good company when Tumi And Friends take to the stage on Saturday, 12 August, 2017 at 20h00 at the Centre Court. Emperors Palace is located at 64 Jones Road, Kempton Park. Tickets from R150 – R350 and are available through Computicket. The show is age restricted PG16. Another great production brought to you by Blu Blood. Follow Blu Blood on Twitter @BluBloodSA or visit www.blublood.com for more information.